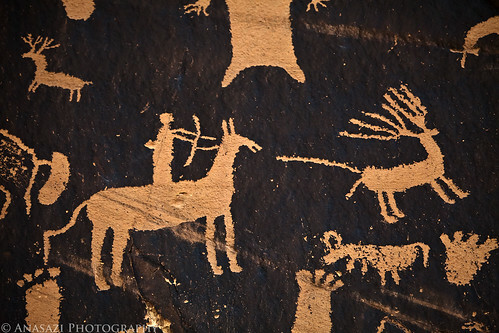 One of the many scenes found on Newspaper Rock along Indian Creek on your way to Canyonlands. The hunter on horseback appears to have just shot an arrow at a deer or an elk and hit their target. I love visiting this site and seem to stop at it at least a few times each year. It always seems like I discover something new on this panel every time I visit.